Einstein once said, “Make things as simple as possible, but not simpler.” I’ve adopted his statement as my mantra. My goal is to educate traders with clear and concise information about computer hardware. One way to keep it simple is a DOs and DON’Ts list to address the most common issues traders have. 1. DON’T trade on a single monitor. DO use multiple monitors—at least two. Research proves having at least two monitors improves your productivity by 25% or more. As a trader, you should consider it a requirement to use two monitors. Even if you’re not an active trader, who’s day and swing trading the markets, viewing your news feeds, research, and charts across two or more monitors is extremely helpful. Without two monitors, active traders run the risk of missing trading opportunities. 2. DON’T trade over WiFi, if possible. DO connect your computer via Ethernet cable. A world without cables and wires would be a serene place. But, we’re not there yet. WiFi slows down your connection speeds. Traders need the fastest possible connection they can get. This means connecting your internet modem and desktop computer directly with an Ethernet cable. Using WiFi is fine for watching movies and checking email, but not for trading money. And, please, please… Do NOT access your trading accounts over public WiFi—ever! 3. DON’T buy a computer with too little RAM. DO research the minimum requirements for your trading software platform. The best deals and sales at the big box computer stores are for computers that are under-powered for traders. These machines are usually short on memory, too. Pay careful attention. That ultra-thin laptop might only have 4GB of RAM. Is every major retailer selling under-powered computers? No. Just understand traders need between 8GB and 16GB of RAM. Don’t buy a computer with anything less. 4. DON’T forget to benchmark your processor’s speed. DO read our buyer’s guide to discover the minimum benchmark score every trader’s computer should meet. You can easily spend $1000 to $1500 on a new computer only to find out it freezes up when you use your trading platform. Adding extra indicators on your charts makes this worse. How do you avoid this problem altogether? Easy. Benchmark your computer. We have a tool that will tell you if your computer is up to the task. Use this tool on the computer you already own, or on the one you’re planning to buy. 5. DON’T overinvest in graphics cards designed for gamers. DO invest in a high-quality graphics cards with dedicated RAM. Traders don’t need fancy graphics cards that generate 3D images. Those are unnecessary and expensive. You do need a graphics card that is above-average, though. High-powered graphics cards are still a critical component for traders. Your graphics card must have its own processor and memory to keep up with your incoming trading data. 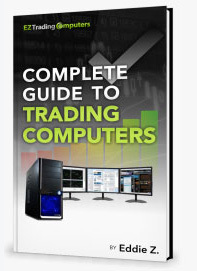 For more details on the exact requirements, see my buyer’s guide for traders. 6. DON’T buy a computer without technical support or warranty. DO go with a vendor who plans on supporting your machine via phone and remote software. If there’s anything I’ve learned from being in the computer business for many years, it’s this: everyone needs help once in a while. Traders DO NOT need to spend time on tech stuff. Ever! Your goal is to trade, not to get distracted with Windows BIOS settings. When you need help with your computer during the trading session, do you have a company you can call via phone? Will they answer immediately? Can they run remote diagnostics? What about hardware failure? Will your computer company send for the machine and repair it? Ask these questions up front to avoid a catastrophe down the line. 7. DON’T run your trading computer without a UPS (uninterrupted power supply) and power conditioner. DO always keep your computer protected from changes in electric current and from thunderstorms. Your computer is a sensitive appliance. Dips and spikes in electricity will cause a meltdown. There’s a cheap and easy solution. Don’t plug your computer directly into the wall for power. Run it through a UPS, preferable one that has power conditioning built in. 8. DON’T download anything from an untrusted source onto your trading computer. DO keep your trading computer separate from the rest of your internet browsing. I highly recommend you keep your trading computer dedicated to trading. Limiting online access is the best possible way to avoid problems. Viruses and malware primarily come from email attachments, software downloads, and the websites you visit. 9. DON’T buy a computer that’s not matched to your trading platform, market type, and trading style. Before buying, DO consult with a computer expert who understands the business of trading and the necessary computer hardware. The first question I require every member of our sales team to ask is, “What do you trade?” They ask this first so we can carefully match you with the right build. (All our desktop computers are made to order). Think of it this way: Would you purchase a suit that doesn’t fit? Of course not! Traders have the option to get their computer tailor-made to the demands of their trading platform, market type, and trading style.